Directly download April 2019 software update factory image for your Google Pixel device. This latest build, based on Android Pie, is available for the complete Pixel lineup, starting from the original Google Pixel and extending to the most recent Google Pixel 3. Despite recently releasing Android Q Beta build — Beta 2 to arrive this week as well — the company is still committed to its monthly security updates. Apart from addressing security issues each month, Google also takes the time to address any bugs that have been reported. For April 2019 specifically, quite a few have been fixed. You can read ahead to manually download April 2019 security update for your Pixel device. Pixel devices are designed and engineered by Google. Since the brand also develops Android, Pixel devices are the first to get software updates. Similar to Android Q Beta being released first only for Pixel, the April 2019 update is arriving for them first as well. To update to the new build, there are two routes. One, you can go to your device’s settings menu and check for the update there. Region differences or annoying Latest updates have already been installed glitch can block you from running new software. To go around that, the second procedure relies on manual downloading and installation. This is more reliable and covers a wide variety of scenarios such as when you have mods like custom ROMs, root or TWRP custom recovery running on your phone. Official download links for complete April 2019 Android 9.0 Pie update have been attached ahead for Pixel phones. Also, we have listed the complete change-log as well. List of devices compatible with new April 2019 security patch are: Pixel 3 XL, Pixel 3, Pixel 2 XL, Pixel 2, Pixel XL, Pixel and Pixel C.
Prior to making these images available for manual download, Google starts pushing them directly through their update servers to compatible devices. We did see Check for Update functionality, which is built-in to the Android system, being fixed in the previous build so hopefully, it wont be causing any problems this time around. To check for an available update, go to Settings > System > System update > Check for update. Packed within these new builds are improvements listed below. NOTE: Pixel C is the only device receiving this month’s security patch bundled with Android 8.1 Oreo whilst others will get it with Android 9.0 Pie. 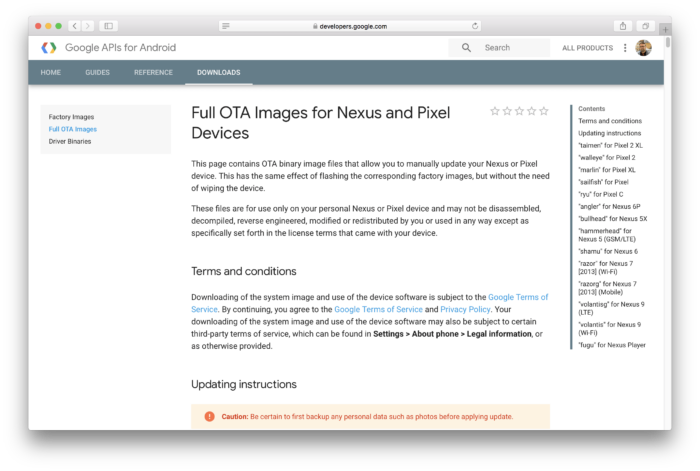 NOTE: If installing these factory images on your Google Pixel or Nexus devices, you also need the latest fastboot tool. You can get it from the Android SDK Platform-Tools package, which you can download here.